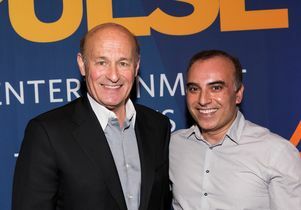 Stan Kasten talks to UCLA's Sanjay Sood about the business of baseball and the L.A. Dodgers. At a Feb. 10 conference where more than 400 UCLA Anderson M.B.A. students, faculty and alumni gathered to hear from industry giants in media, entertainment, sports and technology, Stan Kasten, president and CEO of the Los Angeles Dodgers, delivered some good news about the franchise, with opening day just a little more than a month away. 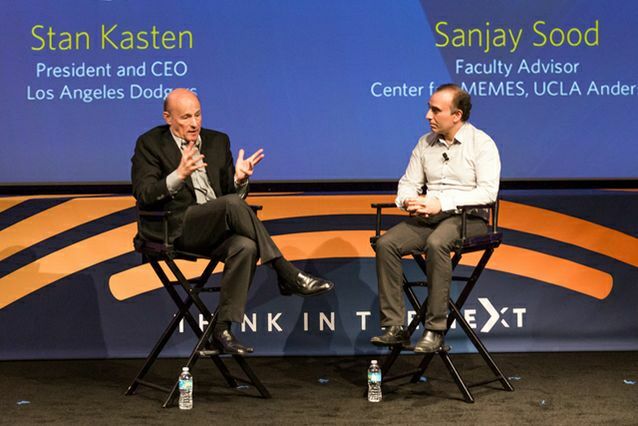 Kasten’s proclamation came during his keynote conversation with UCLA Anderson professor Sanjay Sood, faculty director of the UCLA Anderson Center for Management of Enterprise in Media, Entertainment and Sports, at Anderson’s 2017 Pulse Entertainment, Sports and Technology Conference held in Korn Convocation Hall. 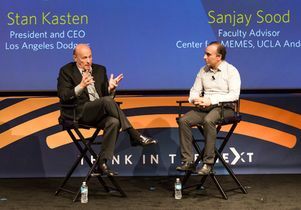 Kasten was joined at the conference by other speakers, including Les Moonves, chairman of the board, president and CEO of CBS Corporation, and Steve Bartells, CEO of Def Jam Recordings and a 1992 alumnus of Anderson’s Executive Education program. The discussion between Kasten and Sood covered a range of topics, from baseball’s business practices and innovations to the Dodgers’ prospects for the upcoming season. The former largely revolves around the quality and quantity of content the sport has to offer. He noted that the Major League Baseball’s “At Bat” app allows fans to access games, news and highlights via their smart phones and tablets wherever in the world they find themselves. Kasten also talked about baseball’s decision to unify its content. “We made the decision in 2000 to merge all the digital intellectual property. Everything was tightly controlled to the benefit of everyone.” That effort, known as Major League Baseball Advanced Metric, led to the spinoff media company BAMTech. Disney invested $1 billion in BAMTech last summer; the media giant now owns 33 percent of BAMTech with an option to become a majority stakeholder. The current Dodgers ownership includes a group from Guggenheim Partners led by Guggenheim CEO Mark Walter, Lakers President of Basketball Operations/business leader Magic Johnson and Mandalay Entertainment CEO Peter Guber. Guber, who teaches classes in leadership at UCLA Anderson, is also a co-owner of the Golden State Warriors, who are building a virtual reality-equipped arena in San Francisco. Kasten said that Guber is heading up the Dodgers’ VR efforts. On the television front, Kasten is hopeful that the team will soon resolve issues surrounding their current TV deal. The deal is very profitable for the franchise, but games are seen in only about half the L.A. market, owing to a distribution dispute with DIRECTV and other providers. The U.S. Justice Department, Kasten said, filed a lawsuit against DIRECTV as a result, and that case is now in federal court. For fans heading out to Dodger Stadium in April, Kasten said the team will continue to use variable pricing — the practice of pricing each game differently based on a variety of factors, including who the opponent is — as a way to close the delta between the primary and secondary ticket markets. On the field, the Dodgers continue their pursuit of their first World Series championship since 1988. Kasten spoke of the organization’s commitment to building a winning team by developing a strong pipeline of young talent through their farm system. That commitment, he said, is starting to pay off; he noted that the first player the current ownership drafted was shortstop Cory Seager, who was recognized as the league’s Rookie of the Year in 2016. The team continues to seek maximum efficiency of their roster through their analytics department (Kasten joked that analysts were his only employees whose job descriptions he could not describe). They also plan to beef up their international presence with the reopening of their baseball academy in the Dominican Republic. 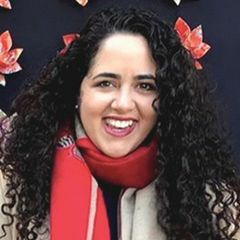 This story is posted in the UCLA Anderson blog.